From time to time, I’ll rip apart devices just because I want to know what’s inside. I mean, usually you know what’s inside - but sometimes, there’s more. Those are the happy days. Sometimes, it’s just a tiny PCB and a lot of weight. Those are the not so happy days. I’ll start this series - which hopefully evolves a bit more than the last series I’ve started here (which I still intend to finish… some day) - with the Tektronix TPA-BNC. What’s the TPA-BNC, you might ask? Well, you have probably seen Tektronix scopes before. If you haven’t, you probably haven’t been interested in electronics much, which is ok, but then you might not find this post as interesting as intended. Tektronix has different types of scopes - none of them are cheap, so some are expensive, some are more expensive, and some are just the hell of expensive. Still, they rock. And as part of this series, I want to myth-bust the question if measurement equipment (not just Tek’s) is overpriced or not. You know, electronic is cheap, so a good scope can’t cost much more than a few hundred bucks… or can it? I don’t have a scope for you to show at this time. So let’s focus on peripherals: The simple scopes usually use plain BNC connectors. The disadvantage is that once you have an active probe, that probe needs power. Also, probes have different properties, like the attenuation factor, might measure current instead of voltage, or have electronically controllable settings. That’s why Tektronix introduced several different interfaces, that feature different capabilities. A pretty common interface to active probes is the “TekProbe-BNC” interface. For the high-end range of scopes (like those which can be as expensive as a small house), they introduced the quite massive “TekConnect” interface. It provides symmetric voltages (+/- 15V, +/- 5V) and a data bus. It’s basically the same as the TekProbe-BNC interface, just that it allows more bandwidth and a better connection. For the mid-range scopes, like my beloved DPO4034, they introduced yet-another low-cost version, which doesn’t use a symmetric supply (instead, 12V “Bulk” are provided), and features a data-interface that looks like I2C… This interface is called “TekVPI”. 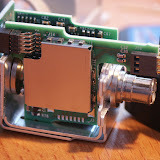 Now, if you happen to have a TekProbe-BNC probe, and happen to have a TekVPI scope, you need an adapter. That’s the TPA-BNC. It costs about $400, and plugins into a TekVPI slot, and provides a TekProbe-BNC interface. I’ve bought one of that. Is the myth busted? I’ll let you take the decision on that. It’s definitely more than a passive adapter, but on the other hand, it’s not rocket science either. There are no high-frequency components, since the signal path is left unchanged. The device content pretty much matched my expectations.